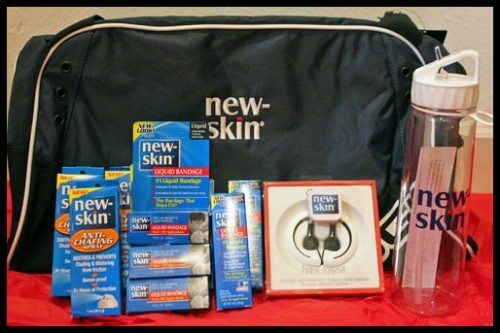 I was so excited about being part of the Team New Skin program. I figured it would really motivate me to run while using the New-Skin products. Unfortunately planter fasciitis had other plans for me and pretty much derailed any plans of running or even walking too much. I found if I tried to run or even walk it irritated my heel more. After seeing the doctor we agreed that it would be best to not run or walk excessively if possible. That didn’t stop me from getting a chance to try out the New-Skin products we were sent. 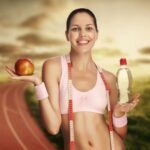 While they may be good for runner’s they are, of course, good for all kinds of people and reasons. I am not a fan of traditional bandages when it comes to covering a scrap, blister, etc. The reason is they NEVER stay on or stay in place. Or if you have a scrap on your arm, or anywhere with hair, trying to get the bandage is just not fun at all. 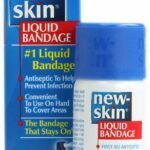 I was excited to try the New-Skin® Liquid Bandage. I honestly had no idea that this type of product was available over the counter. I know I’ve seen it used in hospitals (from personal experience) but didn’t realize that it could be purchased at your local pharmacy or grocery store. During the summer the kids tried to get outside when they could. They never stayed out very long due to the hot Florida sun. One day Honey was playing basketball with the boys when she tripped and skinned her knee. Now Honey DOES NOT like traditional bandages at all, and has always refused to let me put them on her. She feels that everything can be fixed with a wet paper towel. She also refuses to let me put on any type of antiseptic when she has a scrap or cut. I was able to convince her to allow me to use the New-Skin® Liquid Spray Bandage. It took some convincing of course, she was so afraid it was going to hurt. As with most things with children it is the anticipation that is worse then anything else. Once I gave it a spray she was surprised to find it didn’t hurt at all. 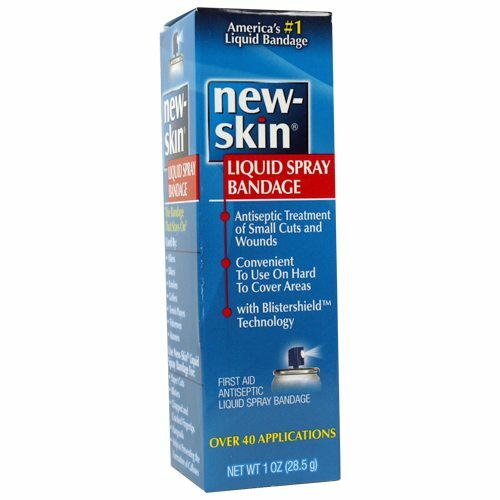 The New-Skin® Liquid Spray Bandage is the perfect solution for us. It goes on easily with out any rubbing or touching and protects better then traditional bandages (in my opinion). 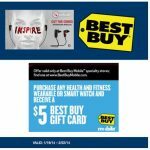 I didn’t get a chance to use the New-Skin® Anti-Chafing Spray, yet, but I wanted to share a little bit about the product. New-Skin® Anti-Chafing Spray is a waterproof silicone-based formula that prevents and soothes chafing and blistering from friction or rubbing. This easy to use, no touch spray application goes on as a thin protective layer and creates a barrier against friction and moisture. New-Skin® Anti-Chafing Spray is convenient for on the go use and provides over four hours of protection for your active lifestyle. I suspect that once the sports season begins, for the boys, this product will come in handy. My youngest son will often get a rash on his thighs from the heat and sweat when he is playing. With the New-Skin® Anti-Chafing Spray I should be able to help him a lot with a little spray before he gets out and runs around. I’ve enjoyed using the New-Skin products and was a little disappointed in my lack of being able to run. However I am still motivated to exercise in other ways. The doctor recommended that I use the elliptical machine or bike if I wanted to get in some cardio. Even trying to do a workout tape where I’m on my feet too much aggravates the condition. It has definitely been a little bothersome trying to find something that works for me. I much prefer working out at home and am usually on my feet. What type of exercise do you prefer to stay in shape?